Home Archive Red Dragon Festival of Endurance – the endurance ‘end-of-season’ party! Red Dragon Festival of Endurance – the endurance ‘end-of-season’ party! Red Dragon is one of Endurance GB’s iconic rides, taking place as it does over the first weekend in October, the event provides riders with a great finale to the season. 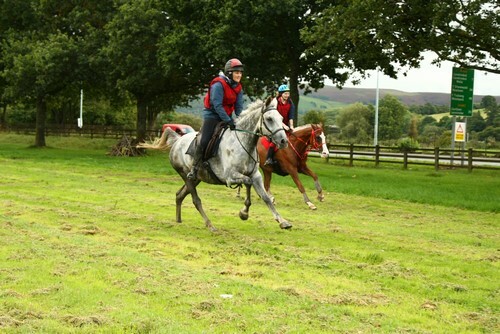 Generously sponsored by British Horse Feeds it runs from the superb venue of the Royal Welsh Showground, Builth Wells, and offers something for everyone, over three days of competition, from pleasure rides to the top class Red Dragon which is 160km over two days. The Red Dragon was won convincingly by Tricia Hirst and Vlacq Bronze Image (Shah Shadow x Huttons Ambo Chloe), picture above, who also took the Best Condition award. The plucky little part-bred was ready for the challenge, although Tricia confirmed “It was a very tough ride this year due to the torrential rain on Saturday that then made the route very muddy on Sunday. I was delighted with ‘Imy’ who looked like she hadn’t done anything at the end.” The Hirst family made it a clean sweep with Tricia’s husband David winning the Best Crew award. Carina Kane riding the part-bred Arab Evermore Artistic (Kayeed x Evermore Expressive) won the 80km Little Dragon in a close racing finish from Sam Mowatt riding Golden Dream. The showground, with its unique terraced parking, offers great facilities with plenty of room for camping, corralling, and stabling. From Thursday onwards the endurance world descends on the showground to park trailers, pitch tents and build corrals. Everyone has their favourite spot and Cornish endurance rider Sue Speed, winner of the three-day Dragon’s Days, has had the same corner for years! Carina Kane winner of Little Dragon. Results at Red Dragon are hugely influenced by the weather, and this year was no exception. On Friday it was dry and sunny, with riders finding the route riding well, but on Saturday, the first day for the top classes, the weather deteriorated with heavy rain all day. Vetting at base and at the Painscastle half-way vet-gate takes place under cover however out on the route riders, horses, and crews got very wet and very muddy!